From now through 7/30/2013, use promo code: WEDJULY25 and enjoy 15% off wedding orders of $149 or more, 20% off wedding orders of $249 or more, or 25% off orders of $299 or more. Click here to browse wedding invitations! Merchandise must total $149, $249, or $299 or more, respectively, before taxes, rush processing, proofs, shipping and other charges for promotion to apply. This offer applies exclusively to wedding invitations, response cards, reception cards, direction cards, enclosure cards, menus, place cards, napkins and programs. This promotion code cannot be combined with other offers. Offer is not applicable to previously placed orders, shipping, taxes, rush processing charges, and excludes photo books, calendars, gift certificates and items from our Thermography, Letterpress, Foil Stamping, or Engraving collections. 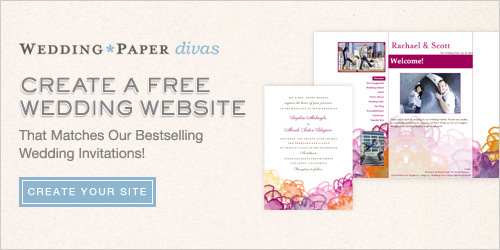 Offer is only valid on Wedding Paper Divas and is not applicable to third party or partner websites. To prevent abuse, we reserve the right to discontinue or modify this offer at any time without notice. We reserve the right to cancel any order at any time. Offer expires 7/30/2013 at 11:59 pm (PT). From now through 4/9/2013, save big on wedding invitations and reception stationery. Enjoy 10% off orders of $99 or more, 15% off orders of $199 or more, or 25% off orders of $299 or more using the code 25APRWED at checkout. Offer expires 4/9/2013 at 11:59 pm (PT).